Houston author Chris Cander, whose new novel is Whisper Hollow, published by The Other Press. This week I’m offering you two Write The Book Prompts, thanks to the generous suggestions of my guest, Chris Cander. She just participated in a literary showdown recently, at Brazos, her favorite local bookstore in Houston. The event was in honor of independent bookstore day. Four participating Houston-based novelists were given a prompt and had thirty minutes to create a story each. Chris is a fan of working under pressure, which she says helps a writer bypass self-censorship. The bookstore employees picked out a romance novel that had “Texas” in the title. They read the first page aloud, which was full of raw passion and prairie angst, as Chris puts it. The main character was fleeing a difficult and traumatic situation. So the challenge was to write a story that would expand upon that summarized trauma in detail. Chris says it was a great prompt with a rich, ripe setup. It was fun and funny, because there were no expectations. She says you could do anything with this. Pick a genre. If you write literary fiction, pick something pulpy; if you write mysteries, maybe pick a historical novel. Then spend 30 minutes turning a piece of it into something different. It can help to unblock you and it’s a lot of fun, particularly in a group. Chris also has found this second prompt useful. Because confession had a large role to play in her book, Whisper Hollow, Chris offered herself the challenge of letting a character she was having trouble with write a confessional letter to see what that character would say, what information might emerge to help her push through. Good luck with these prompts, and please listen next week for another. New interviews with best-selling novelist Tana French, whose new Dublin Murder Squad mystery is The Secret Place, published by Viking; Vermont poet and veteran Jon Turner, who has worked extensively with the Warrior Writers Project and Combat Paper, and is now a member of the Farmer Veteran Coalition; and our own book mentor, Claire Benedict, co-owner of Bear Pond Books in Montpelier. This week's Write the Book Prompt might involve going into your attic or basement. Find a box in your home whose contents you’re not entirely sure of. Write about what might be inside. Include memories of events that the possible contents trigger. Then open the box, and write about what you do, in fact, find there. A new book chat with Claire Benedict, owner of Bear Pond Books, in Montpelier, and one from the archives with Kenneth Cadow, Vermont children's author of the book Alfie Runs Away, published by Farrar, Straus and Giroux. Roz Chast, Can't We Talk About Something More Pleasant? Today's Write The Book Prompt is to write a poem, story, scene or essay about an experience of running away. Music credits: 1) “Dreaming 1″ - John Fink; 2) “Filter” - Dorset Greens (a Vermont band featuring several former South Burlington High School students, long since graduated). 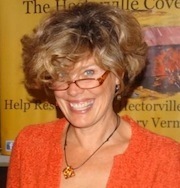 Three conversations about self publishing: Kathryn Guare, two-time self-published author of the Virtuosic Spy Suspense Series; Kim MacQueen and Cindy Barnes, co-founders of Barnes Macqueen Publishing Resources in Burlington, VT; and Claire Benedict, co-owner of Bear Pond Books in Montpelier. Today's Write The Book Prompt is more of a marketing exercise than a writing prompt. Think about how you would want your book to look if you were going to self publish. Do a little research: wander your local bookstore looking at covers and thinking about what draws the eye, and why. Are you picking up the same colors over and over? Do you prefer the look of a painting, a softly lit photograph, or bright graphics? How about the inside? Do certain fonts make you squint? Does one book feel better in your hands than another? Why? Is it about weight, page quality, margins? Take notes, look for trends. And then later, try to fit these ideas into some notions that you could convey to a designer. Not that you should design your own book; that work is not everyone’s forte. But if you have tastes, you should know what they are so that you can be a participant in the process of bringing your own book into the world. Award-winning author Ann Patchett, named one of the 100 Most Influential People in the World by Time Magazine in 2012, whose latest book is This Is The Story of A Happy Marriage, published by Harper. Ann Patchett is co-owner of Parnassus Books in Nashville, Tennessee. This week’s Write The Book Prompt was generously suggested by my guest, Ann Patchett. Write something about one of your parents or grandparents, or an older person that you’ve known all your life, who is important to you. This person can be dead or alive. Write a scene that encapsulates his or her personality. Not an obituary, although it might be a sort of spiritual encapsulation of who this person is or was. But convey that without giving the facts of the person’s life. 1) Vermont author Susan Katz Saitoh, whose book Encounter With Japan: An Adventure In Love chronicles her mother's trip to Japan, over 50 years ago, to meet her pen pal. 2) The second WTB Book Chat with Claire Benedict, of Bear Pond Books in Montpelier. Claire talks about The Goldfinch, by Donna Tartt; Karen Joy Fowler's We Are All Completely Beside Ourselves; A Tale For The Time Being, by Ruth Ozeki; My Brilliant Friend, by Elena Ferrante ; A.S.A Harrison's The Silent Wife; and Richard Russo's Elsewhere. Today's Write The Book Prompt was suggested by my first guest, Susan Katz Saitoh: Write a story that is true but sounds like it's not true, or a story that is not true but sounds like it is true. A Japanese mime and storyteller from Massachusetts gave that as an exercise during the only storytelling workshop Susan ever attended. Interview from the archives with novelist Alice Lichtenstein. We discussed her book, Lost, which was published in March 2010 by Scribner. Today's Write The Book Prompt is to write about either an arrogant, opinionated person committing a subtle act, or a shy, nervous person creating a public disturbance. Author Lewis Buzbee, interviewed at the request of a listener. (Thanks, Shannon!) We discuss his middle-grade novel Bridge of Time, published by Feiwel and Friends, and his nonfiction book for all readers, The Yellow-Lighted Bookshop, published by Graywolf. Today's Write The Book Prompt was suggested by my guest, Lewis Buzbee. He calls this "the memory thief," and it's a timed writing exercise. The memory thief is on his way to your house. You have just ten minutes before he gets there. You get to keep any of your memories that you manage to write down before he arrives. Anything you don't get on paper is lost to you. Write madly, without censoring yourself or taking time to edit. Lewis says that wonderful, weird images will come out of this prompt, and people almost always start in childhood.